I like Swiss Chard. It grows really well in my garden, has a mild flavor as greens go, and can be substituted for spinach, kale, and other hearty greens in soups, stews, frittatas...you name it. Plus, it has a long growing season. In fact, we've had a frost or two and it's still chugging away in my garden like it's nobody's business. Unfortunately, this year we ended-up with too much. I planted about 8 plants plus we joined a CSA, so I was receiving bunches of it from the farm each week. We've also had a busy summer where I wasn't home cooking as much, so I really couldn't keep up with it. I had to find a way to preserve it. When it comes to greens, the easiest and most common way to preserve them is to blanch them in boiling water, drain, then freeze. However, I find they get mushy and lose the fresh flavor that I love, so I was looking for something a little different. I considered pressure canning them, but I figured that'd have much the same problem, plus they'd get kind of gray-ish. Then, a thought hit me. In my family, we've always eaten brassicas and greens (broccoli, spinach, cabbage, etc.) with a dash of vinegar. I don't know where it started, but my Dad always did it and so I picked-up the habit. It's a great way to give them a little pick-me-up flavor without drowning them in sauce or seasoning. 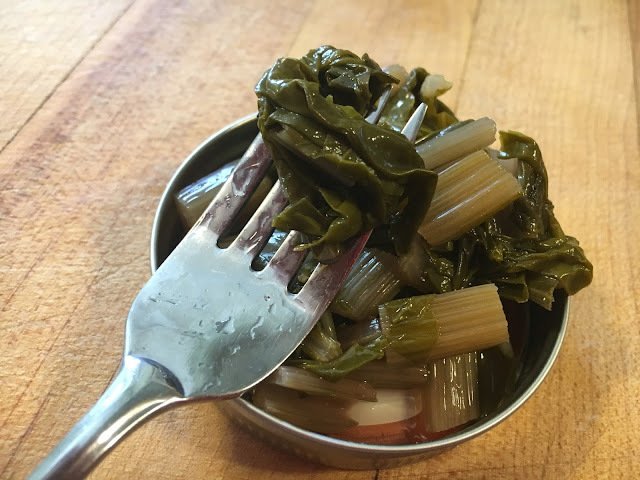 So why not pickle my chard? 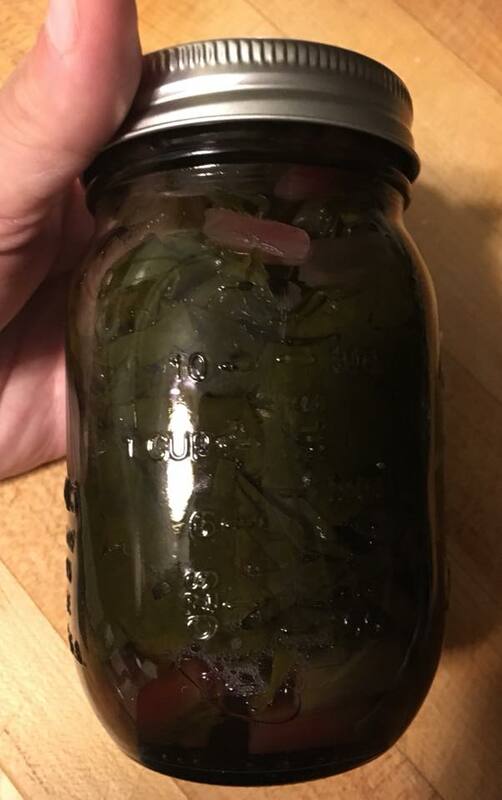 I tried a single jar and it came out awesome. So here's the recipe for you today. Wash chard leaves thoroughly. Strip the rib out of the center and chop it into half-inch pieces. Chop the chard into 1 to 2 inch squares. Bring a pot of water to a boil. Working in batches, blanch the chard and stems in the water until the greens wilt slightly. Remove into a colander and run under cold water to stop the cooking and set the color. Prepare brine by bringing ingredients to a simmer until the sugar is dissolved and liquid is hot. Pack washed pint jars with 1 teaspoon of salt each and blanched chard, packing it full but not so tightly that it is compacted. Leave 1 inch of head space. Pour brine over chard in jars leaving 1 inch of head space. De-bubble as necessary. Make additional batches of brine as needed to fill jars. Place lids and rings on jars. Process in a boiling water bath for 10 minutes. A 50/50 vinegar/water brine recipe is typical for most vegetable pickles and according to the NCHFP, sugar and spices can be modified at will in a pickle recipe (sugar is not acting as a preservative). This particular recipe was adapted from the Food In Jars recipe for Garlic Dill Pickles with additional review of similar recipes. A processing time of 10 minutes was chosen instead of 5 minutes to err on the side of caution against the chard being packed too compactly and making a denser product than cucumber pickles.